While you might have planned out exactly when you'd like to settle down, get pregnant and expand your family, your body might have alternate plans. As annoying as those questions are, especially since you already planned every romantic detail of your life out in your sparkly pink diary at the tender age of 18, you aren’t getting any younger. And while you’ve got a particular reproductive timeline in mind, your body might have a completely different one for you. 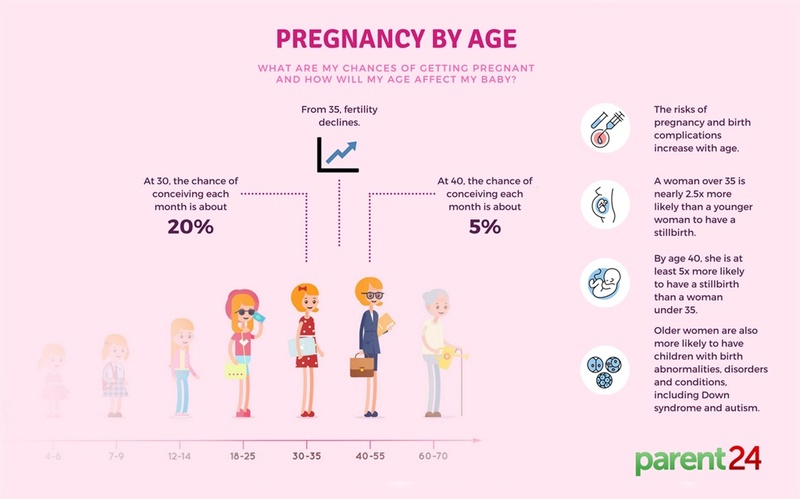 The following graph shows your chances of getting pregnant the older you get, according to Khatamee and Rosenthal and gathered from Baby Centre. The chart is based on average figures and based on women who are considered to be in the best of health at the time of conception, or rather, trying to conceive. According to the statistics gathered from Your Fertility, from around 32 years old, your chances of conceiving decrease “gradually but significantly”. From 35 fertility decline begins to speed up and by 40 it will have fallen by half. So at 30 years old, the chance of conceiving each month is about 20%. At 40 years old, it’s around 5%. Also read: When are you most fertile? Your fertility also suggests that as women get older, the risks of birth complications increase. Complications may include birth via caesarean section, as well gestational diabetes, placenta praevia and placenta abruption. A woman over 35 is almost 2.5 times more likely than a younger mother to have a stillbirth and by 40 years old, she is more than 5 times likely to have a stillbirth than a woman under 35. At 40 years old, the risk of miscarriage is greater than the chance of a live birth. Older women are also more likely to have children with birth abnormalities, disorders and conditions, including Down syndrome and autism. What if I’m older than 35? It would appear that the best age for you to have a baby, without any help, is before 35. But that doesn’t mean you can’t have a baby if you’re 35 and older. You might just need a little help. So what's the deal with donating eggs? It is undoubtedly easier, biologically, to conceive before your mid-30s, but as Weschler explains, there are ways to “shift the odds back in your favour”. So while everyone else might be a tad overly concerned about your reproductive timeline, you’ve got time. And if you’re worried you might not, you’ve got options. At what age did you get pregnant? Did you find it easy to get pregnant? If not, what worked for you and your family? Share your stories by emailing chatback@parent24.com and we may publish them. Do let us know if you'd like to remain anonymous.